Gleaning Info for 4 Generations Using Obituaries/Funeral Programs (Part 1) - who is nicka smith? When you’re working with scant information, several obituaries can come together to expand and enhance your previous research. This post is one of two that documents the process of tracing family members starting with obituaries. For part two, click here. Before we begin, let’s get our terminology straight. We’re dealing with both obituaries and funeral programs in the instance of the hypothetical stack we received from our deceased relative’s belongings. Keep the proper perspective when noting details mentioned within each document. Everything written was created at the discretion of the writer/creator and can be entirely subjective. I’ve seen funeral programs that mention the decedent having a “sunny disposition” while those who remember the person have NEVER mentioned the decedent with this attitude; in fact they more often referred to them like Evaline from The Wiz. LOL On the same note, I’ve seen wives and outside children miraculously disappear when official records and oral history state they indeed existed. This means we should use the Genealogical Proof Standard when assessing each of the facts presented. That means conducting an exhaustive search and getting at least sources for each fact mentioned. Of course it would be much easier to just to take what the obituary said as law, but that’s not sound research. While anyone would read the details on the obits and jump right into online research, there’s a possibility that information could be missed by doing so. So, we’ll start with the analysis of each obit/program. I suggest opening the links in one window for review and then leaving this window open for comments. 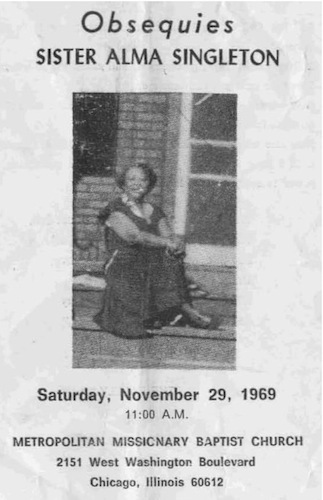 For the sake of both posts, we’ll say that the deceased ancestor we got these obits/programs from was an unmarried maternal grandmother with the surname Atlas who was born and raised in Lake Providence, LA and lived in Chicago, IL during her life. I’ve written this post to share how I extract all of the info below into my genealogy database that’s kept mostly offline. 99% of what I’ve typed here is in the database. In part 2, we’ll cover how to use this offline information to find more info online and offline. Death Date: January 25 ???? Service Date: January 30 ???? 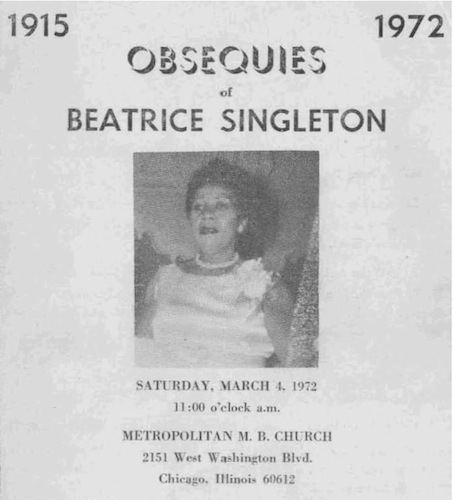 Bio Details: Daughter of Burrell and Alma Singleton [Previous obits/programs mentioned above]; one of 4 children; church membership: Central Baptist Church, Rev. Jessie Kent in Lake Providence, LA; moved to Chicago in 1943 [she was 26 years old]; joined Metropolitan MBC [Same church funeral was held at. This confirms my notation above of family likely being members of this church], member of club number four, Mrs. Arlene Brooks, president [This name was on the funeral program for her mother, Alma, under “Remarks”]; daughter: Regina Singleton, sister: Ruby Carter [We’re missing 2 other siblings. What are their names? ]; brother in law: David Carter [likely Ruby’s husband], aunt: Louise Atlas [No other aunts and uncles mentioned; have they died before the decedent? First mention of a relation to an Atlas in the three obits/programs]. One alleged relational tie to the Atlas family with the names of other Atlas’ mentioned in the services. An alleged tie to the birthplace of the ancestor who left the obituaries/funeral programs. 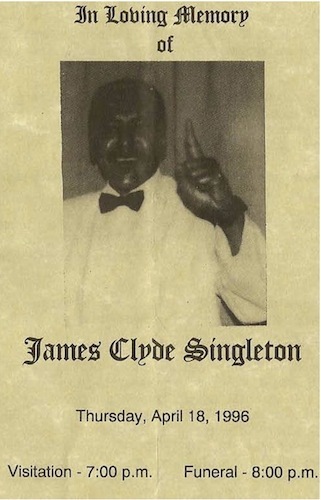 Bio Details: Fourth of four children of James C. Singleton and Joyce M. Singleton-Sinquefield [Youngest of those listed on the program of James Clyde Singleton, noted as deceased in 1996], baptized at St. Paul MB Church. Church membership: Center of Hope Ministries Rev. 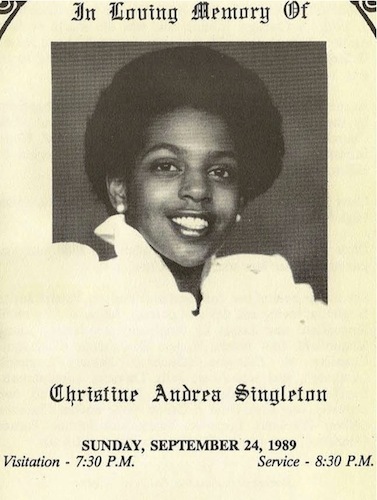 Regina S. Hillman-Durr in 1988 [age 23, the year before she died], Schools: Clara Barton Elementary, Visitation High School, Children: Famis Crawley (deceased), Patrick Singleton [mentioned in program for James Clyde Singleton], sisters: Angela D. Johnson (Tamaigo), Claudine M. Ellington (Duncan), Pamela Lumpkin (Anthony), grandparents: Lucille and Alexander Turner [Mother’s maiden name revealed since we know the paternal grandparents names. One alleged relational tie to the Atlas family and the names of other Atlas’ mentioned in the services. Is there anything I left out that jumps out at at you? What else would you note before you started doing more research online and offline? Where would you look for information outside of the US Census? What would you look for offline? Comment with those things below. (1) “Obituary.” Merriam-Webster. Merriam-Webster, n.d. Web. 23 Feb. 2015. <http://www.merriam-webster.com/dictionary/obituary>. (2) Definition adapted from “Elegant Memorials.” What Is a Funeral Program. N.p., n.d. Web. 23 Feb. 2015. <http://elegantmemorials.com/what-is-a-funeral-program>. (3) “Obsequy.” Merriam-Webster. Merriam-Webster, n.d. Web. 23 Feb. 2015. <http://www.merriam-webster.com/dictionary/obsequy>. 2) Burr Oak Cemetery—one of the deceased was buried there. That is the cemetery that came under scrutiny about 3 years ago when bodies had been moved, some never buried and other issues arose. 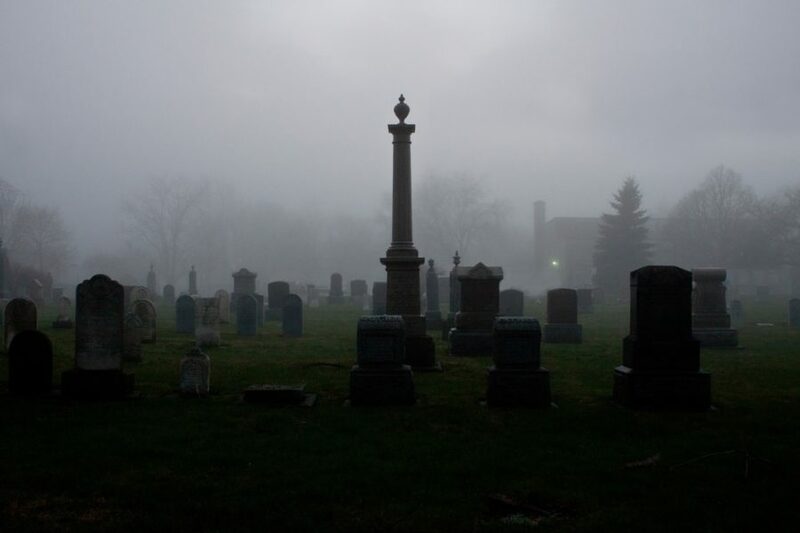 There is now a database of burials for Burr Oak Cemetery. 3) City Directories for Chicago, St. Louis and if one exists Lake Providence LA. 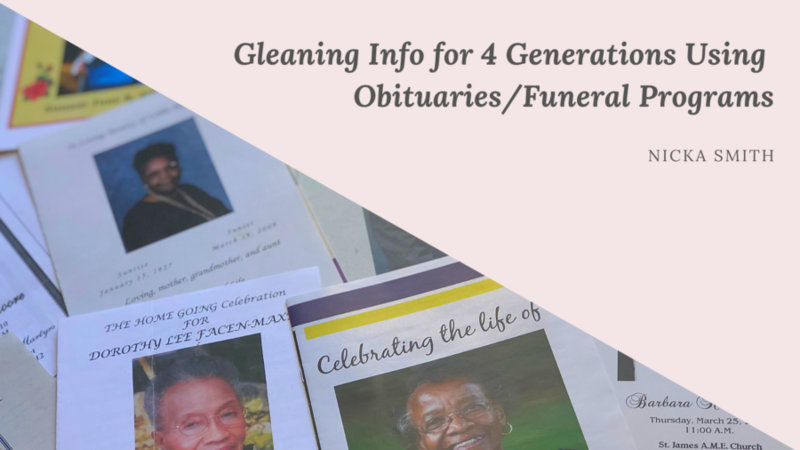 Pingback: Gleaning Info for 4 Generations Using Obituaries/Funeral Programs (Part 2) | who is nicka smith?